The Student Press Law Center (SPLC), the Freedom Forum Institute, and the Newseum in Washington, DC, have banded together to declare that 2019, the 50th Anniversary of the Supreme Court’s Tinker decision, the Year of the Student Journalist. With a year of activities planned, and toolkits available for those interested in participating, the goal, in part, is to raise awareness for the New Voices legislation. New Voices legislation is aimed at returning student journalists First Amendment rights to the Tinker standard, before the Hazelwood Supreme Court decision that increased the ability for school administrators to censor students. “Student journalists play a key role in the civic life of their community. Not only do they report on important issues in the life of a school or school district, but as the number of professional journalists has dwindled, student journalists often also fill the gap in reporting on county, state and regional issues. Student journalists are not only learning valuable skills that will last a lifetime but more and more, they are breaking real news around the country. In Kansas, when students set out to do a profile on the recently hired principal, they uncovered discrepancies in her reported credentials. When they pressed her, they found her answers evasive. Coached by their advisor to take the work seriously, tried to verify certain facts the new principal provided, like her BFA from the University of Tulsa, only to discover that the University doesn’t offer that degree. The students ran the article, leading to the new principal’s resignation. In Utah and Vermont, student journalists broke stories about teacher misconduct, only to be censored by the administration. In the end, the censorship helped these stories become reach audiences nationwide, leading to reversals in the administration’s policies, and New Voice legislation in Vermont. In the era of #timesup and #metoo, it seems especially short sided to silence the voices of students speaking up against teacher misconduct. Aside from demonstrating the critical need for New Voices legislation to protect student journalists and their advisor’s First Amendment rights, the campaign has three major goals in 2019. Raise awareness! Student journalists doing crucial work, often filling gaps in news deserts, and reporting on community issues that would otherwise be ignored. Highlight challenges. Student journalists and their advisors face problems unique to their demographic, like prior review policies, and censorship from the administration for optics instead of content. Demonstrate the importance of journalism education to develop adults who maintain an engaged civic life. Whether you are a teacher, librarian, student, parent, or community member – it’s easy to see the importance of supporting these students as they strive for the same protections in school they have at home. As part of the Year of the Student Journalist, Newseum, a museum dedicated to freedom of the press, will display the front pages of student publications in their display on Pennsylvania Avenue, exposing those chosen to a vast number of views from the heavy foot traffic in the area. If you want your school paper to be involved, email Newseum for instructions. Write an op-ed about why student press freedom is important. Tell us about your piece. Post on social media using #StudentPressFreedom. Make sure to tag SPLC! 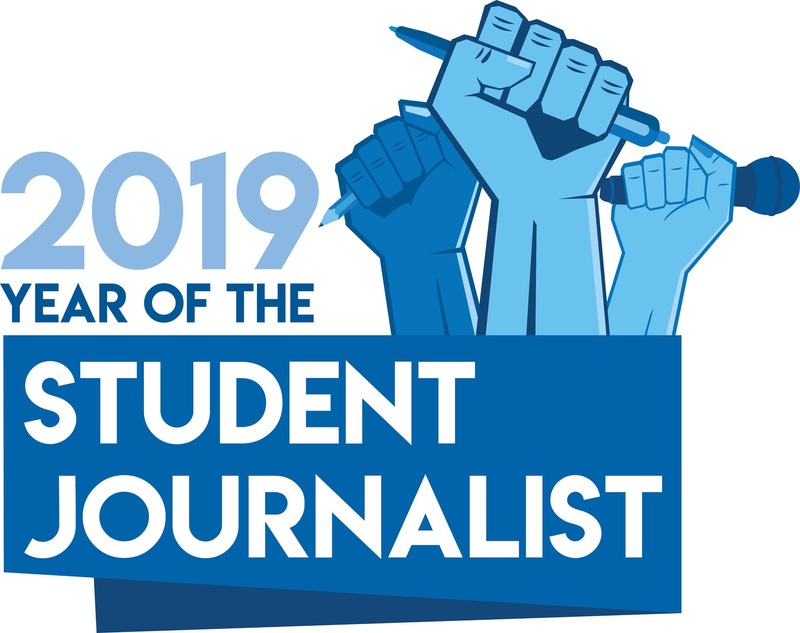 You can download the official Year of the Student Journalist logo here. See if there’s an active New Voices campaign in your state and join the coalition to help protect and promote student press freedom and an end to censorship! Create events to celebrate student journalism. Participate in a partner-planned event, or create your own and tell us about it. It has never been more important for everyone to help imbue students with the sense that the First Amendment is crucial, not something they need to be protected from. As the future leaders of the republic, what we teach them now will shape their concepts of truth, honor, and civic responsibility for the rest of their lives. We must teach them to take their First Amendment rights seriously, and trust that they will grow up to do the same for the next generation. Stand with student journalists this year, and demand New Voices legislation in your state. Help support CBLDF this year as we fight for students’ First Amendment rights all across the country, by checking out the latest signed comics in our Reward Zone, or treating yourself to something from Humble Bundle this February.